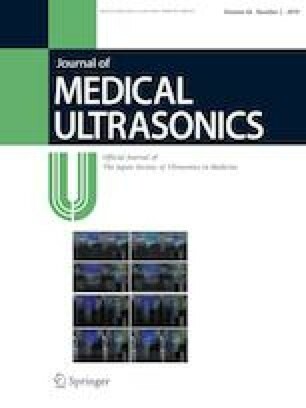 This study sought to compare ultrasound-guided measurements of the abductor pollicis brevis (APB) using the water bath technique (WBT) and the direct contact method (DM) and investigate whether the DM can reproduce the measurements that would be obtained with a non-contact method, such as the WBT. The APB muscles of 80 hands (40 healthy adults) were measured. The WBT was performed in a plastic container filled with water. The probe was placed adjacent to the skin surface without contact. In the DM, sonographic images were obtained with the probe and skin separated by sufficient transmission gel. The muscle thickness and cross-sectional area (CSA) were calculated with both methods. All subjects were examined three times by two examiners to estimate the inter- and intra-observer reliability. Bland–Altman analysis was performed to examine the agreement between the methods. No significant differences in the thickness or CSA of the APB were found. The interclass correlation coefficients for the WBT and DM showed almost perfect intra- and inter-observer reliability (range 0.87–0.94). There was no systematic bias between the techniques in the Bland–Altman analysis. Similar to the WBT, the DM provides measurements of the APB thickness and CSA without causing morphometric changes. We thank Rebecca Jackson, PhD, from Edanz Group (www.edanzediting.com/ac) for editing a draft of this manuscript. The authors have no conflicts of interest with regard to the presented research.